Our most popular probiotic capsule formulation containing five superior strains of freeze-dried probiotic microorganisms that specifically target and help the small and large intestines, improving the intestinal microflora and digestive processes. 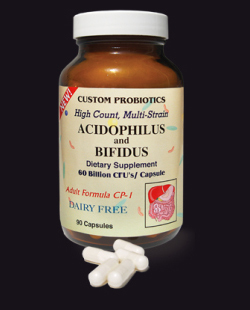 High Count, multi strain Acidophilus and Bifidus dietary supplement. 60 billion cfu’s per capsule at the time of expiration. 90 capsules per bottle. Microcrystalline cellulose, magnesium stearate, silica, gelatin capsules. STORAGE / TEMPERATURE STABILITY Our probiotic supplements are temperature stable for 2-3 weeks without refrigeration. We have done 2 year temperature stability testing on our probiotics . We overdesign our probiotics so that the loss will not effect the potency indicated on the label. One can travel with our probiotics for 2-3 weeks without refrigeration. It is best however to keep probiotics refrigerated for optimum potency. Below is our 2 year temperature stability study for your information.